Choose App Marketing to make your business accessible to mobile audience: Contact us now! In order to establish a profitable business out of a mobile app, you should effectively use the marketing process of an app. This strategy helps to generate a high ASO score. You can help the right users find your app in a crowded market by optimizing indexed copy. Introduction of modern devices, program tools, apps, software, etc., eased your daily activities. With time, mobile devices have become a typical phenomenon. Developers create various robust application in order meet your business needs. With a growing number of mobile apps, it is essential to know the App Marketing strategy that can enhance your business. After developing an application for your business, it is important to market the app. It is the key to the success of the application. Reach our experts at Tech Support Dubai to get smart strategies of application marketing. We are the best to choose from when it comes to Mobile App Marketing Services. With specific and specialized mobile marketing strategies, we design your application to target audience and ensure that the app is downloaded and used by these clients. We have gained great success with mobile marketing services in Dubai. Our careful evaluations prior to app development help to market the app in the right way. These evaluations also ensure that we have happy clients that are able to stick within their budgets. Users also contact us for app development and marketing services as well. Our experts provide a full-proof marketing plan following the steps and procedures in order to successfully launch & promote your mobile app. Various marketing tricks are also implemented by our marketing experts such as review generation, social media campaigns, and in-app marketing to make your app popular. 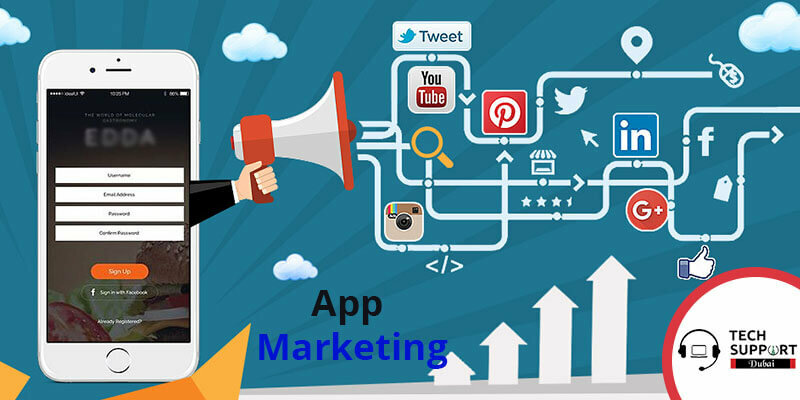 Get the best marketing strategy for your Mobile app. Call us today! Your search for reliable Mobile App Marketing Services ends with us. Place a call at our helpline number 042053349 and connect with the experts at Tech Support Dubai. Our experts are the best in developing and managing your app’s social community. We introduce relevant and fresh media content to interact with audiences. We focus in marketing your app in a way so that you can improve your business. Our experts are capable of meeting all your requirements. We are also available via email, live chat or text message. Reach us soon as we are always happy to serve you. We also provide FaceBook Marketing services in Dubai.